Using some of the most powerful supercomputers on the planet, the fine folks at Argonne National Lab have constructed a virtual model of the universe that tracks 1.1 trillion particles as they expand and bind. The achievement is four times larger than previous simulations. The project, called the Hardware/Hybrid Accelerated Cosmology Code (HACC), is an effort to use supercomputers to model the physics of mass in an expanding universe. 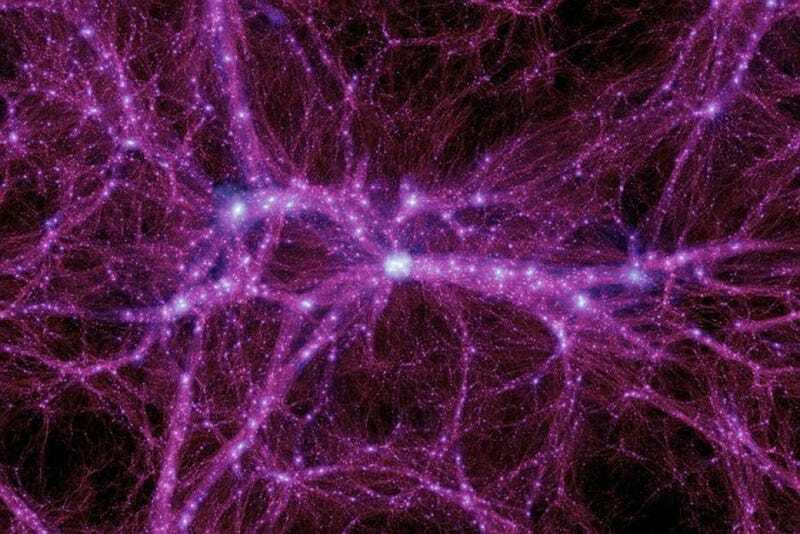 This type of work could eventually yield important insights into the nature of dark matter, the enigmatic substance that composes about 25% of the cosmos. And who knows — perhaps powerful simulations like these will eventually shed light on whether or not we ourselves live in a simulation. To get there, the project needed help from some of the most powerful supercomputers on earth, drawing processor time from Titan at OCLF, Sequoia at Lawrence Livermore Lab, and Mira at Argonne Labs. Running on Titan, the simulation used over 25 petaflops of peak processing power, a speed that only one other computer in the world could manage. The simulation architecture also had to be unusually flexible to work across all three machines, and the code has been nominated for a high-performance computing award as a result. But researchers are quick to say that what's happened so far is still just a trial run, designed to test out the architecture's capabilities. "The hope is that starting in January, we'll run a mix of medium-sized simulations on Titan along with one or two really large ones," project leader Salman Habib told The Verge. The team's recent efforts produced a micro-model of the universe at about 7.4 billion years after the Big Bang, which is about 5.4 billion years ago. The HACC simulation starts with an extremely dense and uniform universe, but as it runs it expands in a series of thousands of steps. From there an initial uniform structure forms a complex "cosmic web" that churns out an intricate clustering of mass across vast distances. It's within these clumps of matter that galaxies and other celestial phenomenon form. Unlike other simulations that build virtual systems molecule by molecule or atom by atom, HACC's trillion points of mass are not exact representations of physical objects. Instead, the developers are trying to track where the mass is in the universe; the particles are "tracer" particles which represent conglomerations of mass, like galaxies.